About 8-9 years ago, I started watching The Gospel Truth broadcast by Andrew Wommack Ministries. The message of God’s unconditional love and grace radically changed my life. I had been born again about 30 years at that time, and never heard the gospel as truly “the too good to be true news” as I was hearing it on this program. I attended my first Gospel Truth Conference in Leesburg, VA several years later, and then another at Temple University in PA. 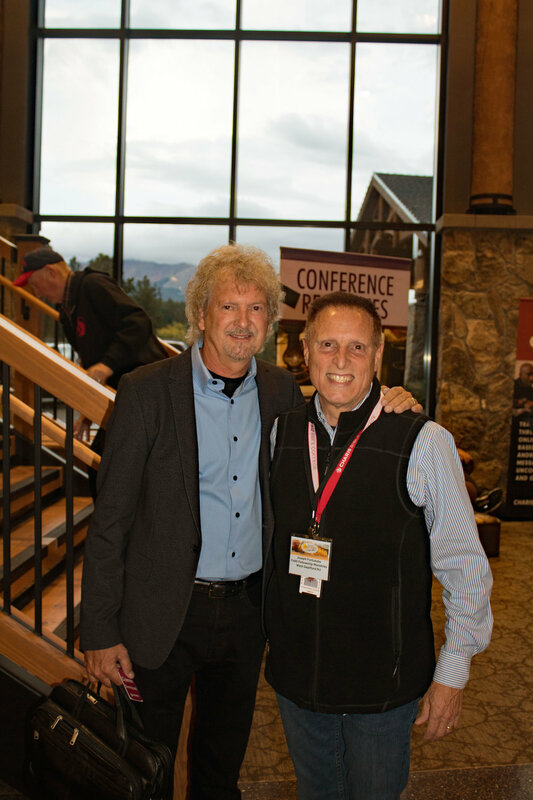 In January, 2014 I had the privilege of attending the Men’s Advance with my father-in-law in Woodland Park, CO. Soon after, I became a member of ARMI (Association of Related Ministries International). I just couldn’t get enough of the Word! In 2016 the Lord lead me to enroll in Charis Bible College through the Continuing Education for Ministers program. I was so thankful for this program which allowed me to take the first two years of Charis Bible College off site. I graduated from the two-year program this past January, and immediately began hosting the first Charis Bible Studies in New Jersey, which is still going strong. Soon after graduation, the Lord put it on my heart to start looking at my options for the third year program. Though there were campuses in Washington, DC, Baltimore and my beloved south Florida that had third year programs, it was Colorado that I was being attracted to. When I told my wife, she said, “Colorado? No way!” The fall was quickly approaching and it was decision time. The big question on my mind was “How?”. How does a 62 year-old pastor go back to college halfway across the country? How would I pay for it? How can I leave my family, my church, and the comfort of my own home? Which lead to a “where”…where would I live? I gave everything to God. I pretty much figured it may not be this year, maybe in 2019. In July, my wife Natalie was praying one morning and the Lord made it very clear to her that I was going to Colorado, that this was “your place called there”. She promptly told me, and this time it was me who said, “No I’m not”. But I knew in my heart it was. I told several of my close ministry associates of my plans and they said it was a great opportunity and to go for it. When I was at the International Pastor’s and Ministers Conference later in the month, one of the pastors had heard what I was planning to do and said that the Lord told him to pay for my housing for the nine months that I am at school. From that point forward, everything started happening – quickly. Because of the strong desire that I have to start a Charis Bible College in New Jersey, I submitted an application to enroll in the World Outreach Global Training School and was accepted. Within days of when my tuition was due, a dear friend called and said that they want to cover the full $5000. Praise God! Another friend said they wanted to cover the cost for me to travel home each month to see my family and church family. And another paid my expenses to travel to Colorado. God also supernaturally provided a beautiful condo at the base of Pike’s Peak, overlooking Garden of the Gods. As for our church and Charis Bible Studies, we found a simple way to Live Stream the messages from Colorado to New Jersey. Where God guides He provides! At the beginning of August, I had the privilege of speaking with the Dean of Charis Bible College, Greg Mohr, who said something to me that set the tone for my entire journey. He said that I would need to find my “rhythm of grace”. I committed myself to honoring this special word from the Lord and look forward to seeing it supernaturally unfold. Early Monday morning, August 27th I left New Jersey for an experience I would never forget. I took three days to drive over 1700 miles and met the wonderful owners of the condo and moved in. The next day, I attended Orientation, and the following Tuesday after Labor Day I attended my first classes. All I can say is “I’m living the dream”. I am in awe of what God has done, and is doing, and all that is yet to come. The courses I’m taking to prepare to have our own college are way outside my comfort zone, but God has brought me here for such a time as this. There’s no better place to be than in the center of God’s will. He is strengthening me for the journey before me and equipping me with all I need to excel, grow, stretch and overcome every obstacle through Christ. 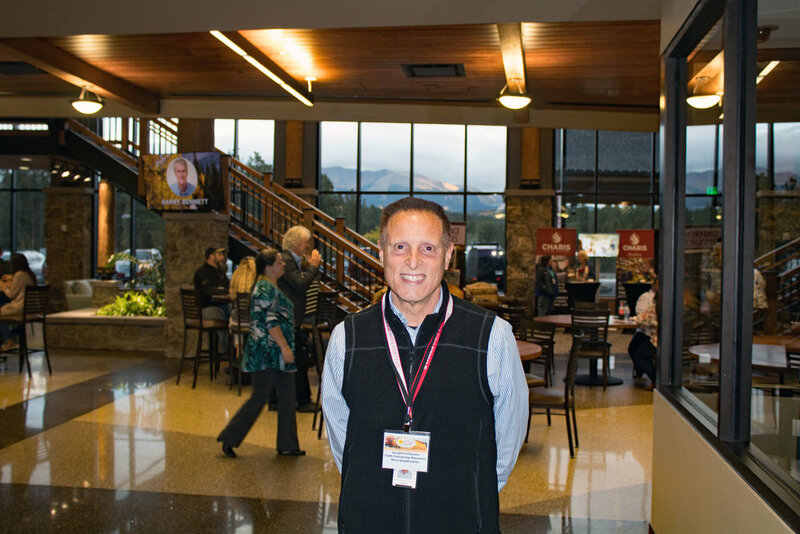 It’s been a month since I left New Jersey for this over-the-top experience at Charis Bible College in Woodland Park, CO. My end goal is to start a Charis Bible College in New Jersey. Charis takes this very seriously, and so do I. They want you to be prepared, equipped, experienced, integral, well-founded and educated on the Charis way. What an honor. After I complete all the requirements, the final decision is still up to the Leadership and ultimately Brother Andrew. I have made it my highest priority to prove myself faithful for this daunting task. God has blessed me each step of the way. I am walking in the rhythms of grace, and it’s awesome! The photos below are from the Annual Minister’s Conference held this month. What a power packed week! Photos from left to right, 1) Dr. Barry Burns, the Coordinator of the Association of Related Ministries International (ARMI) and Van Smith of the Continuing Education for Ministers, 2) Bob Yandian, 3) Pastor Duane Sheriff, 5) Pastor Grant Thigpen, 6) Barry Bennett, and 7) Brother Andrew. What a wonderful time of the year in Colorado! The sun is so bright, the snow is so beautiful. God has truly blessed me in multiple ways by being here. My classes are intense, I’m learning things about ministry and business that I can’t wait to implement upon my return. Everything has exceeded my expectations. One of the highlights of my experience at Charis Bible College has been the wonderful people I’ve had the pleasure to meet. My global Outreach Training Program classmates are from around the country and as excited as I am about the possibility of being a part of a Charis Bible College as the Lord leads. Let me introduce you… Photos from left to right 1) My dear friends Tim and Eldora from Ohio who have treated me to lots of fellowship, laughs, and tacos! 2) Pete and Patty are from Arizona, and they know just when I need an home cooked Italian meal to remind me of home sweet home. 3) Richard, an IT intern here at CBC is a God-send that helps me with my technical challenges. 4) Julisa is a from Woodland Park, an absolutely precious sister in the Lord. 5) Tommy Williams and his wife are expecting their first child, and they’re from Louisville, KY. 6) Jim Newell is from the great state of Hawaii and has blessed me with an authentic Hawaiian meal! It’s all about the food folks! 7) Rosie from St. Marten. 8) Michael from Colorado. 9) Emmanuel from Colorado who was one of my students at FITS in Florida, what an amazing guy! 10) Ted from Alaska. 11) The Harrington’s who blessed me with the most amazing condo in Colorado Springs. Lastly 12) Tannera Garwin is the Coordinator of the Global World Outreach Training Program, and is over-the-top at what she does for all of us. Though it was a short month at Charis before we left for Winter Break, it was a power packed few weeks. Most importantly, was my presentation to a panel of Charis Bible College (CBC) Leaders, answering the question as to why the Metropolitan area of NJ/NY/PA is a strategic location to establish a new CBC. I provided demographic data, AWMI viewership information, and the potential for this untapped yet strategic area for the message of God’s grace and unconditional love. The panel will only choose five presentations presented by students in the Global World Outreach Program, to be used as group projects to provide case studies for new CBC locations. We will be notified of the results after the break. On a lighter note, I had the privilege of attending The Heart of Christmas Musical at the Woodland Park campus. It was absolutely phenomenal! Better than Broadway, in my opinion (video clips here). I’m enjoying myself in every way, and look forward to being with my family for Christmas, New Year’s and then back to college for me. Thank you for your continued support and prayers. I am in my “place called there” and living the dream! I’m more than half way to the finish line to my graduation date! They said the school year would fly by, and it truly has! I had the privilege of my wife, Natalie, visiting with me at the beginning of February. We had such an amazing time seeing the sites together and visiting Charis. She was in awe of the excellence of the Charis campus, thoroughly enjoyed meeting all my fellow students, and loved joining me for a day of classes. The photo to the right is taken in front of the “Place Called There” sign. What significance this phrase is to us as we take this over-the-top journey together. She has been overseeing all the operations back in New Jersey and taking care of our home while I’m away. I could not do what I’m doing without her. I have been so blessed to be able to travel home once a month to spend time with her and to minister to my home church family. There is NO place like home. I am winding down my final weeks at Charis Bible College, and God has saved the very best for last! As the months pass, the workload and expectations from leadership become more and more intense…and fulfilling. I am being stretched in more ways than I ever imagined. Our Team is working feverishly on our “Taking Charis to College Campuses” project, which our final presentation is due at the beginning of May. We’ve spent many, many hours researching the feasibility of this endeavor, and surveying students on secular college campuses in our region. It has been quite an eye-opening experience. In addition, our Spring Semester courses have been phenomenal as well as relevant and making a huge impact in my life. After over 30 years in ministry, I am learning things that I’ve never heard before, and with such excellence. I am still living the dream!